Wang, F.; Luo, T.; Hu, J.; Wang, Y.; Krishnan, H. S.; Jog, P. V.; Ganesh, S. K.; Prakash, G. K. S.; Olah, G. A. Synthesis of gem-Difluorinated Cyclopropanes and Cyclopropenes: Trifluoromethyltrimethylsilane as a Difluorocarbene Source Angew. Chem. Int. Ed. Early View, June 16th 2011. 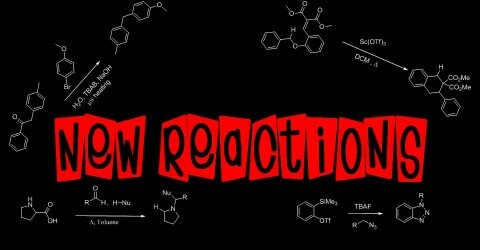 There is nothing I like more (we’ll at least when it comes to life in lab) then a reaction that works. It makes you feel good about yourself and you abilities as a chemist. What’s even more rewarding is carefully examining a problem and solving it, even if that means staying in lab until 11 or 12 o’clock at night. That’s exactly what happened this week in the Leadbeater lab. After spending nearly half a week working on it, we finally found a way to purify a key intermediate in one of my many projects. And it was through what was my least favorite form of purification: column chromatography. Now I say what was. Over the past couple of weeks I’ve not only become proficient in doing flash columns, but I’m starting to enjoy them (gasp!)! I never really appreciated their capabilities and even simplicity until recently. While they don’t always lead to the best yields, they certainly do a bang up job of getting my products pure (and beautiful spectra to match). I stumbled upon an old but interesting pair of posts (one from Org. Prep. Daily the other from In the Pipeline. Both discuss “lousy reactions” or reactions that are pretty well-known but rarely work in practice. There were some pretty good stories and a few that I would want to add to the list. However, I wanted to make (and my apologizes if this has already been done) a list of a few reactions I really enjoy and always, always work. The first is trifluoromethylation via the Prakash-Ruppert reagent (Me3SiCF3 or TMS-CF3). Honestly, I’ve done this reaction countless times as a undergrad. Yields are typically good (>75%) plus the reaction is simple, non-harazdous, and the starting materials are relatively inexpensive. Another one that is also great is using Weinreb amides to construct various types of ketones. Both putting on the amide and converting it into the ketone is extraordinary simple and very general. Another great reaction (and kind of a UConn Chem department specialty) is the oxidation of alcohols to carbonyls using oxoammonium salts. The yellow salt, 4-acetylamino-2,2,6,6-tetramethylpiperidine-1-oxoammonium tetrafluoroborate (affectionately dubbed “Bobbitt’s salt”, after one of its pioneers and UConn emeritus Dr. James M. Bobbitt) is very easily synthesized from commercially available inexpensive 4-amino-2,2,6,6-tetramethyl piperidine. Of all the oxidation protocols I’ve seen (and in some cases done) this is by far the best. All you do is mix the salt with your alcohol and some silica gel at room temperature in DCM and within a day or so you have your oxidized species. Even better, you know the reaction is done when the solution turns white! Soooooo are there any reactions you enjoy doing?!? Also in an unrelated note, quite a few people I know have begun blogging. My girlfriend just recently started up her nailpolish blog called Polish4Pennies where she reviews different sorts of nail polishes. It looks great and it’s well written so go take a look (especially if you are into nailpolish)! Another one was started by one of the undergrads doing summer research in the Leadbeater lab. It’s called No Kitchen, No Problem. It features some creative ways to prepare meals with just microwaves and crockpots, so go if you’re hungry go take a look! Ironically, this week’s article features the Prakash-Ruppert reagent but with a slight twist. Prakash (whom I’ve met and is an amazing chemist along with being a nice guy) is closely associated with an organic chemistry legend and Nobel laureate, George A. Olah. Impart, this is because Prakash obtained his Ph.D. working under Olah. For those of you unfamiliar with Olah, he is up there with Woodward and Ingold in terms of impact on the field of organic chemistry. His main claim to fame (and what got him a Nobel) is close to my heart: the study and exploration of the carbocation. Olah even observed CH5+ via NMR in “superacids” (e.g. fluoroantimonic acid). He even got his wife hooked on chemistry and they have been working together for quite some time. In recent years, Prakash and Olah have been exploring new applications of TMS-CF3 in addition to new ways to introduce fluorine into organic molecules. In fact just about a year ago, Olah and Prakash developed a system of perfluoroalkylating imines using perfluoroalkyl sulfones. While they don’t necessarily pump out ten articles in a year on the introduction of fluorine in organic molecules, the articles that they do publish are of extraordinary quality and detail. This same detail is even reflected in their group (one of the best talks I’ve seen was by a member of the Prakash group). Prakash and Olah decided to tackle a somewhat different problem in this latest article. A few posts back, I mentioned a reagent developed by the Dolbier group known as trimethylsilyl ﬂuorosulfonyldiﬂuoroacetate (TFDA). In the presence of the fluoride anion, it decomposes to yield difluorocarbene which can be used to effect cyclopropanation. However, the problem with this reagent is a) It’s not commercially available b) One of the starting materials, 2-ﬂuorosulfonyl-2,2-diﬂuoroacetic acid, is somewhat costly c) its synthesis, while only one step, is somewhat entailed. The authors mention that there are other methods for generating difluorocarbene, but they suffer from similar drawbacks. Hence if we wanted to access important and possibly biologically active difluorocyclopropanes (one of the major synthons that can be obtained from difluorocarbene) we had to either deal with toxic materials, costly reagents and/or low yielding reactions with limited substrate scopes. Seeking to fix this dilemma, Prakash and Olah investigated the possibility of generating difluorocarbene from TMS-CF3. During the development of TMS-CF3 as a reagent for trifluoromethylation, Prakash noted that decomposition of the trifluoromethyl anion yielded F- and difluorocarbene (giving minor side reactions). Prakash decided to revisit this and attempt to optimize it so that this side reaction became the desired reaction. Olah and Prakash initially screened a variety of F- sources. The key was that they had to be anhydrous (hence the standard source, tetrabutylammonium fluoride (TBAF), was not an option). One of the more popular alternative to TBAF, tetrabutylammonium triphenyldi-fluorosilicate (TBAT), was found to be the best for generating the carbene at low temperatures. Interestingly (and probably a trade secret of Prakash’s) sodium iodide could be used (at elevated temperatures) to induce difluorocarbene formation. With a set of optimized conditions in hand for each type of catalysis in hand, the authors moved onto screening a variety of alkene substrates. As one would expect, electron-rich alkenes reacted better than electron-poor alkenes. Interestingly, when the NaI methodology was used, even unreactive alkene reacted well. Prakash and Olah attributed this to thermal activation of difluorocarbene, facilitating the [2+1] reaction. With this success, Prakash and Olah moved onto alkynes as substrates. These moieties gave substantially higher yields, mostly likely due to the increased electron density in the pi system. What I found interesting was that the reaction was extremely sensitive. The TBAT methodology was not used here, rather the focus was on NaI/heat method. Temperatures lower than 110 oC as well as changing the solvent from THF lead to diminished yields. However, in a few cases lower temperatures were required to avoid decomposition of the cycloaddition product. My favorite part of the article, however, came right at the end. Prakash and Olah combine the two roles of TMS-CF3 in a series of two reactions. By adjusting the conditions, they authors were able to first effect trifluoromethylation (via TBAF) and follow it up with difluoromethylenation of an alkyne (in 85% overall yield!). In two quick steps they introduced 5 fluorine atoms! Thank you for the kind reference to Org Prep Daily. Also, since TBAT is somewhat expensive, so for stoechiometric reactions that need anhydrous fluoride you can make high-quality anhydrous TBAF in situ from Bu4CN (which you can make simply by ion exchange and dry without decomposition) and hexafluorobenzene (0.2 equiv) in anh THF. C6F6 goes to hexacyanobenzene under mild conditions and the resulting pure anhydrous TBAF is surprisingly resistant to decomposition. no problem! Interesting, so I assume the TBAF crashes out of the solution and you filter to get it out? Do you need to story it under dry conditions (glovebox etc? or in a chamber with drierite) ? I def want to give that one a try. Its done in situ – I remember it is used directly as a solution in THF. The hexacyanobenzene presence is a bit of of a nuisance but I suppose its a column workup anyway. Diene to Get Some Olefins New Chemistry Blog: B.R.S.M.